Do you already have Management Console? Log in. Why use the Management Console? 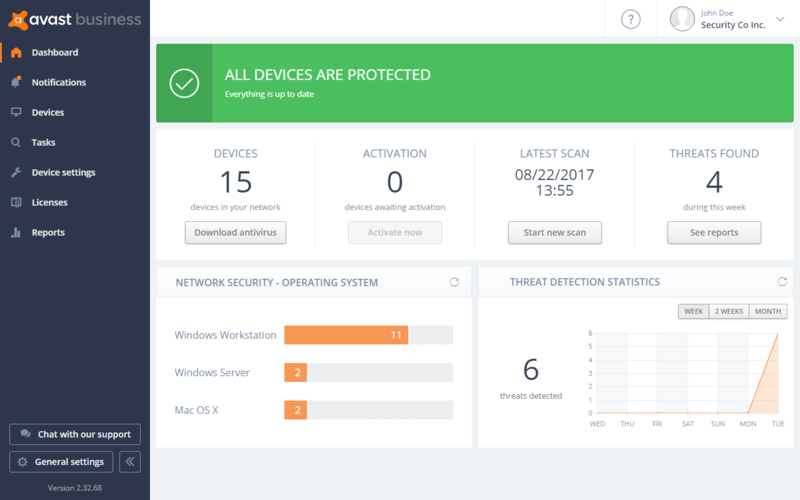 Use the console to monitor the health of all devices from one place, review the number of blocked threats, schedule regular scans, and more. Easily organize devices into groups, create setting templates, schedule tasks, and remotely deploy antivirus without any technical knowledge. Download and distribute virus updates and program updates to all devices via a single dashboard. Management Console is free to use with any Avast Business Antivirus and without any maintenance costs. 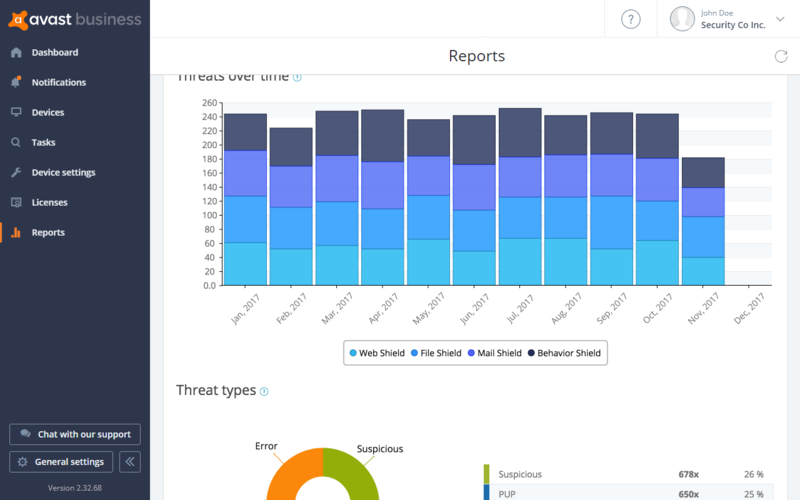 View reports on threats, tasks, or devices, monitor license statuses, and more. Receive updates about critical security events, system information, billing cycles, and more. Easily customize how, when, and where you receive notifications. Simple-to-install security solution that is easy to manage and deploy and can also remove conflicting security software. Additional security feature: activate your newly installed devices manually or automatically. Run your tasks immediately or schedule them for a specific time/s. Save your bandwidth data. A single device of your choice (mirror) will download updates only once and then distribute them to your other devices. Organise your devices into logical groups and subgroups. Create and apply specific settings to a selection of devices or groups. 30 day trial on all three Avast Business Antivirus plans. 1year, 2year, 3year payment up-front. We accept Credit Cards, Paypal, and Wire Transfer. No installation or maintenance costs, updated automatically. See our roadmap, what’s in development and what has already been released. Monitor the health of your network and all connected devices with a comprehensive dashboard. Start with choosing one of three antivirus plans. Continue with purchase or trial and create an Avast Business account. Take a look around, an onboarding will help you with deploying installers to your devices. Devices with installed antivirus will appear in the console. Now you can activate them, organize into groups, schedule tasks, and customize settings. It was very simple. With the option of emailing out the download link and customizing the message, it was very easy for our end users to do the update themselves. I wouldn't change a thing! I like the new Management console. I can simply access it from anywhere within my company, it gives me information about the status of my antivirus and suggests available solutions to found issues. You had me sold with cloud-based administration. We’ve experimented with other products that did not work well. Avast web admin works nicely. The best part of this software is that you can manage all your installs from a single place. Works well on all my computers in the office. I am well informed on each and every alert. I have 8 pcs in my network, and all of them have Avast. The price and the customer service are the best two elements of Avast. We use it internally on all windows computers and servers. It is very simple to use and scheduling scan tasks is straightforward. I am also impressed with the fact that this can be controlled from a central point. We used Webroot and Trendmicro ’s hosted solution but their price and ordering process was the issue. I already have an account in the Management Console but forgot the password. What can I do? Please go to the password reset page and follow the instruction. Why would I want to use the Cloud Management Console? 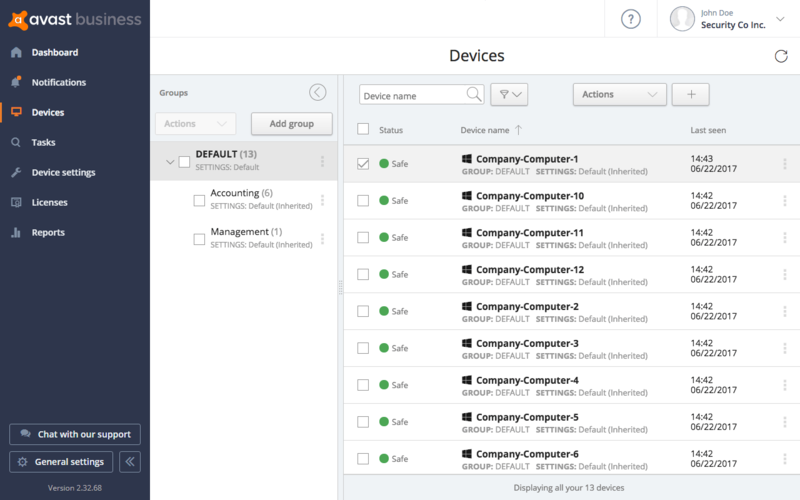 Managing your device settings from the simplified console saves time and bandwidth for you and your company. More importantly, it improves the admin’s performance and immediately alerts you of security vulnerabilities. As a bonus, the Management Console is free to use with any version of Avast Business Antivirus. What is the difference between the stand-alone version of Avast Business Antivirus and a version with the Management Console? Stand-alone installers have to be manually downloaded to each individual device from our website. Any tasks, updates, or customization of settings will be locally saved to each device instead of universally shared amongst all of them. The stand-alone version is useful when you have less than 5 devices and you are not planning to add other devices or licenses in the future. The Cloud Management Console is able to generate and deploy installers to all of your devices, so that all the devices are then managed from the console. For example: the admin can remotely override settings, push tasks, update the virus database, and more from the console without being physically present at the specific endpoint device. The Management Console is useful when your team works from many offices, you employ remote workers, or for non-technical users _ your team’s data is safe without them having to lift a finger. Is the Management Console only for big companies? No, the console can be used with any number of devices. As the Management Console has been designed for all types of small and large businesses, managing and monitoring your devices is simple and easy. Can I manage my licenses (subscription) from the console? Yes, in the Management Console you can start trials of all three plans, add licenses for more devices, extend licenses, and edit any auto-renewals. Secret tip: When you think about it, you’ll get a total of 90 days of free trials after signing up. Can I combine all my Avast Business Antivirus plans in one account? Yes you can. You start with one plan (you choose it here on the web) and then in the console you can choose to add the other two. You can also combine Mac and Windows protection into the one console. Usually, you’ll want to have different levels of protection for different devices (such as servers vs. workstations) and different users (receptionist vs. CTO). Where can I find what is planned for future Management Console releases? Click here to see our product roadmap, current development, and past releases. You can also submit your own feature idea or vote on existing features. What are the advantages of Cloud Management Console? The Cloud Management Console saves you the time and money you would have spent maintaining your own console. Instead of hosting the console on a local machine, it can be accessed from any network on any device via the Cloud, which is maintained and updated by Avast. The Cloud Management Console is automatically updated in roughly 2-week cycles. Does the Management Console have the same features across every plan? Yes, no matter which level of Avast Business antivirus you choose, the interface and features of console are the same. You can also combine various levels of protection (mix licenses, for example Business Antivirus with Antivirus Pro Plus or mix devices with different operating systems) in a single Management Console. The only difference is that for the endpoint devices with the lower level of protection, the features of the more advanced solutions will not be active in the console and you can only use them if you upgrade to a higher plan but the Management Console itself will look the same. 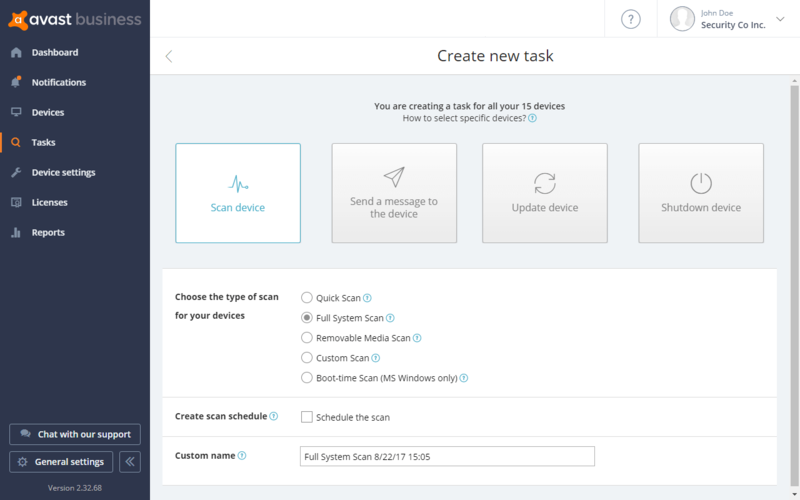 Why do I need to activate new devices after installation? This is a security feature that prevents unknown devices from being added to your console automatically. You can always remove any unfamiliar devices. 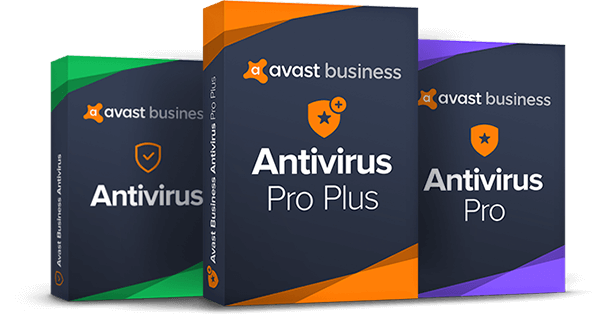 What is the difference between the three Avast Business Antivirus products? The most basic plan covers essential antivirus protection for businesses, with a few other tools to enhance usability. 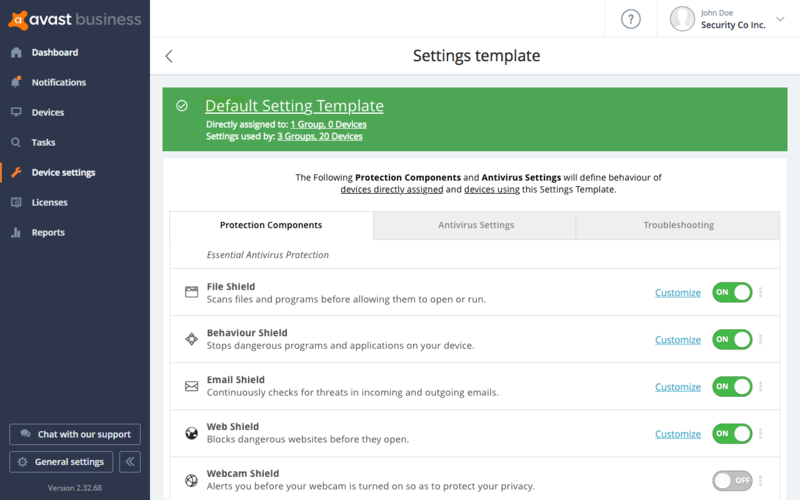 The second (and recommended) plan adds data protection components to the core antivirus product. Finally, in the third plan, the ultimate edition, all the components of the first two plans are present as well as components designed for enhanced identity protection. For a full list of components and their explanations click here. On what platforms/devices can Avast Business Antivirus be installed? See next tab _ System Requirements. Is your product GDPR compliant? We are committed to be GDPR compliant by 25 May 2018. How difficult it is to set up the Cloud Management Console? The Cloud Management Console is very easy to set up. After signing up, you will be taken to the dashboard which will show an overview of your network status. You will also be told what to do next via onboarding messages. The next step will be to review your Device Settings, and after that to deploy an installer to your devices. The final step will ask you to activate the new devices. After that, each of your activated devices will perform scans and will gain a health status such as Safe, Vulnerable or In Danger, depending on if a threat was found and resolved. Can more users manage or have access to the console? Yes. You can add other admins and assign various levels of permission.